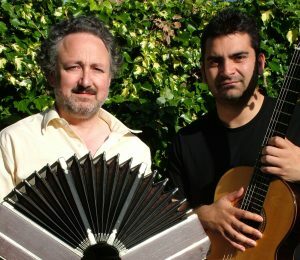 The Khan Rowlands duo perform music ranging from the renaissance and baroque to contemporary compositions by English, Welsh and Latin American composers, as well as the major works for duo of the great Argentinian composer Astor Piazzolla performed on his own instrument, and other tango classics. The duo perform recitals and also appear with orchestras in the Double Concerto of Astor Piazzolla and tango works arranged by Julian Rowlands. Adam Khan is an international touring artist who appears at prestigious concert venues and festivals throughout the world. Adam has championed contemporary guitar music from his native Wales and from Latin America, and in particular Argentina. Julian Rowlands (“tango nirvana” – The Guardian) is the UK’s leading exponent of the tango bandoneon, regularly appearing on national television and radio and at major concert and theatre venues as a soloist and with Tango Siempre and other artists.